Roundup is the trade name for glyphosate, an herbicide commonly used to control grassy and broadleaved weeds in the lawn and garden or in agricultural crops. Glyphosate also sells under the names Rodeo and Pondmaster. As with all chemicals, although a relatively safe product, Roundup requires careful handling around water so that it doesn't harm wildlife or nontargeted species. The herbicide Roundup can harm some aquatic plants. If you plan to use Roundup on weeds near surface water such as a pond or stream, the probability that the product will leach or run off into the water affects its safety near open water. Roundup adheres quickly and tightly to soil particles, reducing the risk that it will run off with rain or irrigation water into a pond or stream. The U.S. Forest Service reports that only 2 percent of the applied product was lost to runoff. In areas where the soil erodes and runs off into surface waters, the risk becomes higher. Microbes in the soil break down Roundup, rendering it harmless in time. In water, Roundup clings quickly to soil and organic particles found in the water, frequently becoming incorporated in the mud at the bottom of the pond. In water, it can take up to 70 days for half the product to break down, a process accomplished by microbes found in the water. Roundup is one of the more toxic glyphosate products to fish and aquatic invertebrates, such as insects and crustaceans. This is because the toxicity of a product additive allowing the product to form a thin film on the foliage of targeted weeds. If you want an herbicide for controlling weeds around your pond or stream, you should select a glyphosate product specifically labeled for control of aquatic weeds. Roundup is not approved for aquatic weed control. Low-level exposures to Roundup in time do not tend to produce accumulations of the product in the tissues of aquatic animals. 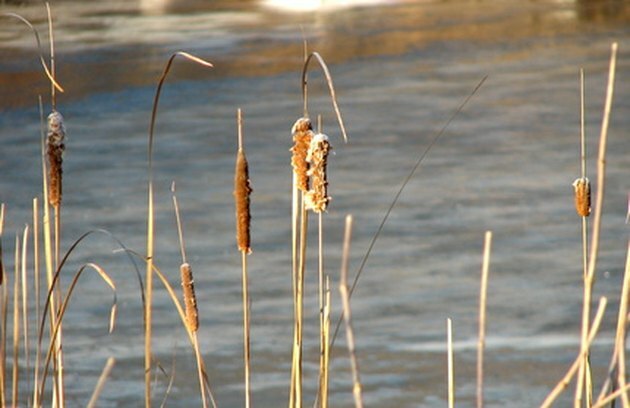 Glyphosate will kill shoreline and emergent plants, plants with their roots underwater and stems and leaves above the water, such as cattails. It poses no harm to immersed or floating aquatic plants. Use care when using Roundup near shoreline and emergent aquatic plants that you want to keep. The Roundup label forbids its application directly to water surfaces or in areas where the product may drift or run off into aquatic ecosystems with threatened or endangered species. When spraying plants near open water, spray them enough to wet the foliage but not so that the product drips or runs off from the leaves and into the water.